Found this cute little gadget on clearance at Target, and garlic chopping will never be the same! Seriously, chopping or mincing garlic by hand is, for me, just a tedious, sticky mess. And as much as I do love my garlic press, it mashes the garlic a bit too much for many recipes. I will never be without a little garlic chopper like this again--it cuts the garlic up into the perfect size mince, and cleans with just a nice rinse under hot water. I've used it dozens of times since I bought it a few weeks ago. One of my new favorite 'kitchen toys'...and it was on clearance! Score! Tip: If you get one of these, you'll need to scrape out your garlic with a butter knife, then tap out whatever is left with the side of the butter knife. Very easy! DISCLOSURE: This post may contain affiliate links. I'm eligible to receive a small commission whenever a product is purchased through these links. Little Big Harvest is a participant in the Amazon Services LLC Associates Program, an affiliate advertising program designed to provide a means for sites to earn advertising fees by advertising and linking to amazon.com. 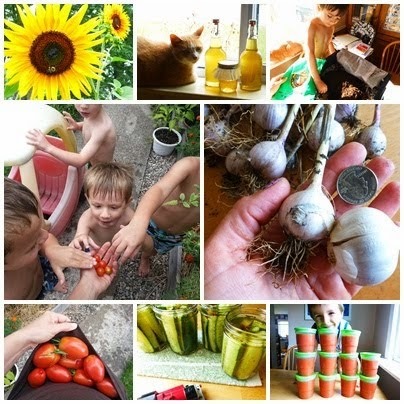 I only post links to products that I either have and know to be awesome, or products that I know would be useful for urban homesteading ventures! Thank you in advance for your understanding and support! Peas, Lettuce, and Carrots, oh My!